[Tutorial] Do you want your MIDI's to sound great? I've been doing this for a while and I figured that some people might want to know how to get different MIDI's to sound better or worse on their own. To start: This will replace what all your midis will sound like when you listen to them in Windows Media Player, or any other player used to play MIDIs. I'm not sure if they'll affect how MIDIs sound in Zelda Classic, as I haven't personally tried. If you're afraid to do this, just remember to make a backup before you start. There are 2 ways to do this. I'll be talking about the permanent way first, then the on-the-fly version after. What we're going to do is replace the gm.dls file in your Windows folder with another DLS file. DLS files, are what soundfonts were before they became as such. This is handy, because you won't have to make sure another program is managing this, and will start whenever you play a midi. For 32-bit Windows users, your gm.dls file will be located here: "C:\windows\system32\drivers"
For 64-bit Windows users, your gm.dls file will be located here: "C:\Windows\SysWOW64\drivers"
Before you replace the gm.dls, make a backup by copying the original gm.dls and name it something like, "backup_gm.dls". That way, if something goes wrong (MIDI is silent, etc), you can go back and replace it with the old one again. Now, you'll probably have to restart the computer for the changes to take effect. Try to play a MIDI and see if it sounds better or worse to you. I've gotten used to how the FF8 DLS sounds, so I probably won't go back. If a more on-the-fly method is for you, you can do so using any soundfont (sf2 files), using another program. This version is a lot more handy, since you can use any soundfont you want with this method, and don't have to rely on archaic formats such as DLS. This program will let you swap soundfonts that you have, with the current one being used. To use, simply press the '+' key to add a soundfont. A dialogue box will pop up, and you have to navigate to the location of the sf2 file. Once you selected a soundfont, you have to tell the program to be the one in charge of playing MIDIs. 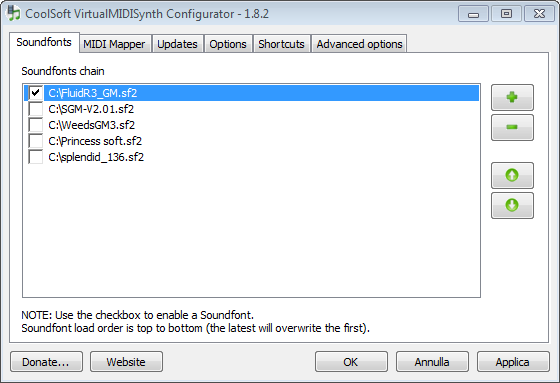 In the MIDI mapper tab, you have to select CoolSoft Virtual MIDI Synth to be in control of the MIDI mapper. Once you have the mappers set to this, you should be ready to go. If you want to go back to the default MIDI sounds, just set the mappers to be Microsoft GS. Edited by thepsynergist, 08 December 2014 - 07:37 PM. It was a spur of the moment idea. I just realized that I had been doing this for a few years now, and someone else could want to try it. Did you find that you were able to get it to work with Zelda Classic? 1) I moved this to GCD. 2) I stickied this because it's awesome. I've been playing around with trackers lately and a lot of them still export to MIDI, so it's nice to know that I can have some control over what I create with them. Yep. Never had a problem with it. I am using it and it works great, but I am encountering issues with it. I load up a midi in ZQ and it plays it well with all the correct instruments and all but when I click out of ZQ or ZC, it bugs up and translates everything into piano chords at a much lower volume with all of the fields in the master midi mixer except Slot 10 (Drums) being blanked out. I am running Windows 10 and am using the SGM-V2.01 soundfont. Edited by Orithan, 02 November 2015 - 07:36 AM. Usually I have the opposite problem (drums not playing, but everything else does). Windows 10 might be the issue, but i'm not certain (just a hunch). Hopefully, someone more knowledgeable about that can help. Edited by Orithan, 02 November 2015 - 06:15 PM.